Sand filters are the most popular styles of swimming pool filters for homeowners. 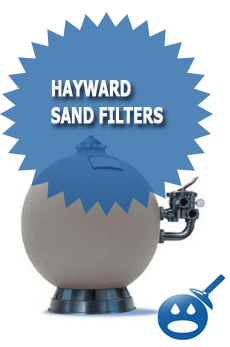 Companies like Jandy, Hayward and Pentair offer the top sand filters in the industry. 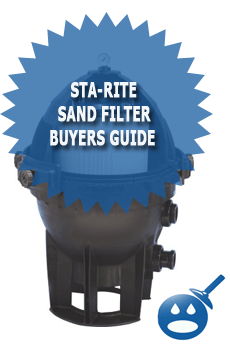 A sand filter is only as good as the sand that you put in. It is like having a luxury car and putting in bad gas. Sand in the filter acts as a filter for the germs, bacteria and contaminants that end up in your swimming pool. The better the sand the more contaminants it will pick up and less chemicals you will need to add to the swimming pool. The sand in these filters is different than sand you would find in the playground or at the beach. The sand particles for swimming pool filters are finer so it can catch more particles in the swimming pool. The sand helps keep the swimming pool healthy and just like any type of swimming pool filter, you have to change the sand. Changing the sand at the start of every season is a great place to start.Here are 4 different types of swimming pool filter sand; these brands are some of the best you can find. We will take a look at Quikrete Pool Filter Sand, ZeoSand Superior Pool Filtration Media, HTH 50 lb Bag Filter Sand and Aqua Quartz Pool Filter Sand . ZeoSand is unlike other swimming pool sand. This sand is pretty green colored zeolite. This sand has a high purity level, it has a three dimensional honeycomb structure that is capable of picking up the finest particles making your swimming pool extra fine. Every bag of ZeoSand contains 100% of all natural zeolites, which is the highest quality available in a commercial grade pool filtration sand. The best thing of ZeoSand Superior Pool Filtration Media is that it is not limited to just swimming pool sand filters. It is also used for other applications such as Private and Public Swimming Pool; it is used with Aquariums, Zoos and Water Parks. It is NSF/ANSI-50 approved for use in all sand brands of sand filters. By switching over from your old style sand to the ZeoSand you will find that your swimming pool is running better and more efficiently. You will have cleaner water and you will save money on chemicals and you won’t have to run your filter as much. ZeoSand is available in 25 pound and 50 pound bags. The 25-pound bag is available for $16.61 and you can find it online or in your local swimming pool supply stores. Aqua Quartz is a 50 LB bag of swimming pool filter sand. It is specially designed for residential swimming pools and commercial swimming pools that use sand filters. This swimming pool sand is graded to meet and exceed the industry standards so it is safe to use on any brand of swimming pool sand filter. This product is a finely graded sand that works on any size swimming pool as long as you have the proper size sand filter for the size of your swimming pool. Many homeowners do not have the right size filter for their swimming pools and no matter how many times they change the sand or switch brands, unless you have the right size filter it doesn’t matter what grade of swimming pool sand you have. The idea is to not spend a lot of money on maintenance of your swimming pool and by using the Aqua Quartz Pool Filter Sand you can do just that. Simply change the sand at the beginning of the swimming pool season and you will have swimming pool filter that will work hard to keep particles out of the swimming pool and keep the cost down on maintenance. You can buy the Aqua Quartz Pool Filter Sand at your local Ace Hardware Store. It is very affordable; it is priced at $ 14.03. Any of these swimming pool sand products we profiled would be a great choice for your swimming pool. Remember, to only use sand that is designed for swimming pools and never use beach sand or playground sand. Swimming Pool Sand is called Silica Sand. You can find these brands in your local swimming pool supply stores or your local retail stores such as Ace Hardware, Walmart and Home Depot and Lowe’s. If you want to save money on your swimming pool this season, then the step in the right direction is to use any of these pool sand products we profiled. Do some comparative shopping and find out which brand of sand is best for your swimming pool. You can really start to see the money you can save right away. You will wonder why you didn’t switch over sooner. HTH is one of the most popular brands in swimming pool products. They have everything to swimming pool chemicals and swimming pool sand. 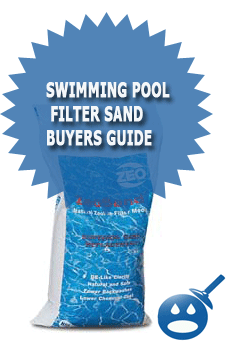 This swimming pool sand is available in 50-pound bags and can be used in any swimming pool sand filter. HTH has a great reputation for having quality products and they are a key factor in making your swimming pool filter run more efficiently and effectively. If you are looking to improve the way your swimming pool sand filter works then the HTH 50 pound bag of Pool Filter Sand is a great place to start. This product is one of the most popular swimming pool sand products in the industry. Without the proper amount of sand, your filter can cost you money rather than save you money. You can find the HTH 50 LB Filter Sand online or in your local swimming pool supply stores as well as stores like Home Depot and Walmart. 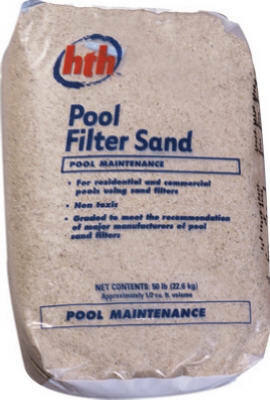 HTH Pool Filter Sand is very affordable and is priced at $ 5.35. Simply follow the directions on how to change the sand. This is a great choice of sand to use and you can really save money by doing the sand change yourself. Swimming pool companies often charge anywhere from $ 75 and higher when you can spend $ 5.35 and do the sand change yourself. Simply follow the directions, it really is that easy. 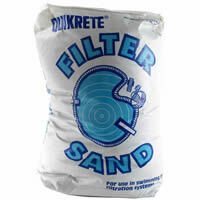 The Quikrete Pool Filter Sand is available in 50 pound bags. This pool filter sand is classified as Silica Sand . The Quikrete Pool Filter Sand is a graded silica sand that is only used for swimming pool filtration systems. This swimming pool filter sand is a 30 mesh and it is created with a method of washing, drying and closely graded. When you have a swimming pool sand filter you want to use the best sand available, this product has sand that is very fine. The Quikrete Pool Filter Sand works in any brand of sand filter. Follow the directions on the bag as to how to change the sand in the filter. 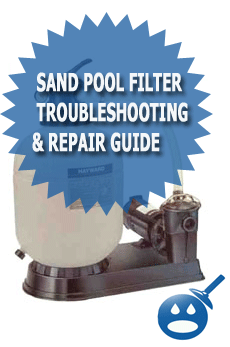 You may also want to consider replacing your sand filter if you have had problems in the past. Your swimming pool will filter the best it ever has if you have all of the parts to make it work. So you may need to replace the filter and start using the Quikrete Pool Filter Sand. This product is available in 50-pound bags but the price may surprise you. You can pick up a 50-pound Quikrete Pool Filter Sand for $ 6.99. You can find this brand of sand online or in your local swimming pool supply stores. I would like to know how much of sand is required for different dia sizes of filters.for eg.950 dia filter what is the sand required. I looked the type of filter that I have online and found out how much I need it it. It usually doesnt tell you by the weight, but how far up in you filter the sand should be. If you read the label on the side of the filter tank it will list the recommended sand size/grade and amount in weight to be added to the tank. The sand itself should last a few years depending on size of the pool and its use. There are only a few things that you should really spend the extra money on. Owners tend to go over board on chemicals and certain maintenance. Sand works better after a bit of dirt, so don’t backwash too often, 10-15 psi over its normal clean pressure. This is Ben Cole,I want to order some Snow & Ice Melter – 50 lb. Bag,that you have in your shop.I want you to get back to me with the price including taxes and I want to know do you accept Credit cards as your payment.Hope to hear from you soon. creating an article marketing blitz and also seasonal changes to the marketing messages. seam of the two halves near the “PANIC” button on one side of the remote. this article, in my view its really amazing in favor of me. Helpful info. Lucky me I discovered your web site unintentionally, and I am shocked why this twist of fate didn’t happened in advance! I bookmarked it.